It’s just me here, trying to figure out what season we are actually in right now and dressing myself accordingly. Anybody else struggling with this unpredictably long seasonal transition period? I hope you said yes, because the struggle is more real than my grown out roots these days (My stylist has been contacted, help is on the way!). As a person who despises a cluttered closet and holding onto items that simply collect dust, I try my best to get creative with pieces that I already have before they hit the local donation centre. Transitional clothing is attractive to me in that it saves my hard earned money, extends the life of my favourite pieces, and simultaneously blends risk-taking with practicality. Similarly, while the term ‘transitional’ doesn’t have to mean monochrome, neutral, or ‘bland,’ it is important to remember that it is you who has the power to push your style over that uni-seasonal edge. With that said, I would like to share my top 5 ways to transform a Summer clothing item to complement a Fall look while making an example of this bright, semi-floral, denim skirt that I purchased for the SS season. While the skirt is a classic denim colour and the red is a Fall essential, I do find the floral part to be a little too bright, hence the need for the dark grey sweater to calm the brightness down a little. Similarly, I opted for a turtleneck because I found it slimming and, most importantly, because it was already in my closet. Lastly, an oversized charcoal sweater, such as Wilfred’s Montpellier, would be a great option as well. I can’t decide whether I genuinely love wearing semi-sheer pantyhose or I’ve been pre-conditioned to do so through my Russian roots (Any family members’ drawers will have stockings of different denier, colour, and size. It’s a real thing, go ask any Russian). Regardless of the denier, black pantyhose provide a slimming effect, keep you warm, and are fairly inexpensive at Winners. Nothing screams “Fall” more than a coat that doubles as a cold-repellent and an accessory. The oversized part comes from the streetwear trend, where one moves away from the traditional, figure-flattering style and aims for the loose-fitting, yet structured comfort, all while oozing chic and elegance. While it may be easy to get accustomed to this trend, remember to balance the loose fit with form-fitting items, such as the turtleneck, denim mini, and pantyhose picture above, as well as heeled boots for elongation. Lastly, while light grey was my choice, coats in Camel, Forest Green, and Aubergine would suit just as well. While the outfit alone is simple and sophisticated, you will need to put your life’s necessities somewhere, so why not choose a subtle, deep burgundy, medium-sized bucket bag, such as this one, to complement your look. 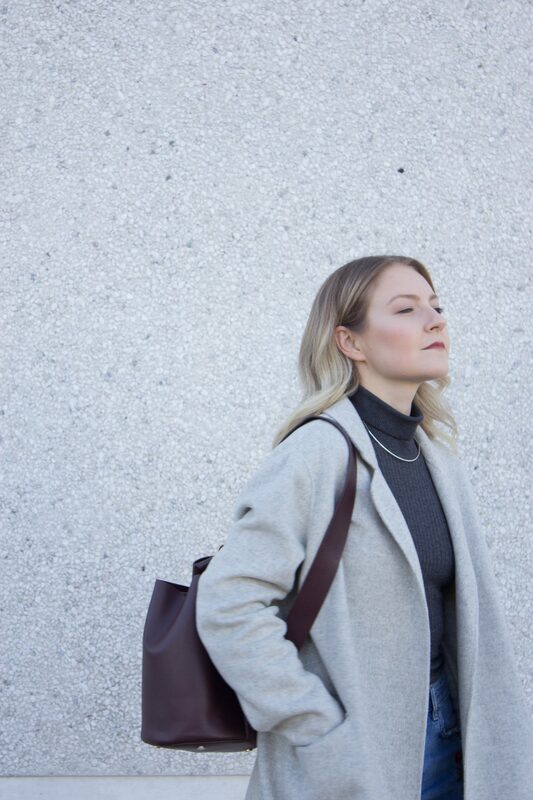 When choosing a bag, opt for deeper tones, such as navy or dark wine, and with subtle details, thus still attracting the eye to an accessory, but only so for a split second. Lastly, a crossbody bag or backpack are great options too. When in doubt, remember that black boots will never let you down. Similarly, comfort should not be compromised, especially living in Toronto without a car. While the heel in these boots may look intimidating, the platform, military-styled sole, and chunky heel provide stability and control to your step. Opting for short heels or flats may compromise the height and the fit of the oversized coat, especially for a petite figure, but is not a deal-breaker for this look. While I may just have started to use seasons as verbs and adjectives, I hope that these 5 steps will inspire and assist you in bringing your Summer clothes to life in the Fall. Similarly, keep in mind that floral dresses, jumpsuits, and maxi skirts are all fair game in transforming them into transitional items, thus possibilities, under the right conditions, are endless. I love fall because of the transitional period and I love that people are still wearing typical summer/spring pieces and matching them with fall! I love the pics and the outfit, especially the skirt!